Exciting!!!! And I can't help but wonder what school it is since my son is going to college out there. I'm guessing it's not his since he starts a few days earlier. We leave Monday and for us the drive is ONLY 24 hours! You're not going to binge this weekend. Out of control eating is part of your past. However, I would suggest that you treat yourself to something really yummy, but just once. It will help to destress you and take away any thoughts or feelings of deprivation. I'm very excited for you. It is scary with such a short turn around time if you were to get the position and accept it. I think you can handle it with flying colors. And there's one thing I want you to consider that I brought up with another friend who was in a similar situation as you. What if you had to move back next year? That is such a great opportunity and I'm keeping my fingers crossed for you! Ask them in the interview if they are willing to offer any help in the relocation. They may offer temporary housing, which could greatly help. It sounds like you have a good support system in Chicago that could help you make the move (like pack up your stuff and send it to California for you if you have to be there that quickly.) Just stay positive and remember that if its meant to be, it will be. Oh my goodness girl!!! I'm stressing for you...Yikes!! I know you will make it through this without a binge. Why would food and or a binge make anything better anyway? A binge would just make you sluggish and feel bad. Don't do it! No you need energy....you need good food, water, a little exercise and of course rest...make sure you get some!! You can so do this!! Really excited for you!!! Keep focused!! So happy for you! I hope the phone interview goes well. And when you're feeling overwhelmed about the prospect of moving across country, just remind yourself that life has presented you with the opportunity to even further reinvent yourself. So happy for you! I need to state that mantra as well. Cali is great. You might miss the skyscrapers, but you will enjoy the produce that comes from the San Juaquin valley where your map is marked. Picking oranges right off the branch. You can run outdoors year round. I wish you much luck and crossing my still fat fingas for you. so exciting!!!! even if you choose not to take the job (which is an option, you know), it's gratifying to be given the chance and to have an opportunity to dream and think about where you'll go and what you'll do. i'll be thinking of you!! kinda crazy that they've left it this long though, so i'd ask them about that. be listening for clues to determine: is the department so dysfunctional that they don't get things done til the last minute? or did someone leave intentionally at the last minute to screw with everyone? or is it a simple case that they weren't able to fill the position earlier? and since it is so last minute, i'd certainly agree with Maia - they should be willing to help with the move in some way, so i'd make sure and ask them about that too. having worked in an academic setting that was in a beautiful setting and perfect job but within a nightmare of an administratively dysfunctional hellhole of a school, remember you have options and go in with your eyes wide open. 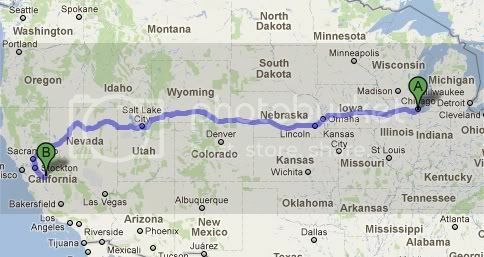 it may be perfectly fine, but you don't want to move halfway across the country and find out its not. search the 'net for former staff/employees, how long they stayed, if anyone's said anything...just to be on the safe side. on the optimistic side, i think you'd love california. the life able to be lived outdoors, the local food options available, etc...i can envision you enjoying life there no doubt. good luck!! can't wait to hear what tuesday brings! WOW! That is amazing - and a massive decision! I'm from the Uk, so to me Califormia says beaches, good weather, natural highlights and being able to exercise outside without worrying about rain, snow, wind, any other weather you care to think up. I'm sure it's not all like that but it sounds like a dream. It's a massive move and it will be scary starting over somewhere new but what an amazing opportunity! And I'm sure your new colleagues will be very friendly and help you out. Good Luck! Everyone has already offered the same advice I would, so reread their comments for me and take the advice you feel comfortable with! If you want it, you CAN do it! Look at what you have already accomplished! This is all so incredibly exciting!!! I really hope you get it because I think this will be such an exciting and exhilarating chapter of your life! AND!!! NO WINTER!!!!! Awesome!!! Good luck on the interview! That's great news Mary. Bingeing will only add to the stress, so repeat, repeat. Good luck with the interview. If you do end up taking the position, everything else will fall into place. Sure it will be hectic, but you are strong and can handle ANYTHING that comes your way. So very exciting! Good luck on the interview. It will work out. If you decide to take it I think it will be a great job and adventure. Wish you good luck with the job interview. Wow what an exciting thought!! Because there will always be a next big change. So exciting! You will do great tomorrow. They will be lucky to have you. And if you have questions on Cali, let me know. If I am looking at the map correctly, I am familiar with the area that you have marked on the map. I've lived in NorCal for the past 20 years. Ah ha! This is what you were on about on Twitter. Wow, what an opportunity. Grab it, grab it with both hands and don't let go! Good luck with the interview, you can do this! So exciting!! You'll have a great interview, Mary! Can't wait to hear more! What an exciting opportunity!! Good luck with the interview! Man I can read fast if there is urgency! Congratulations on your new job and such a really good job teaching your passion. What a load off! And so so SO good that you did not binge. I cannot say I would have been able to bear it. But you are all the stronger now. Central Cali huh? Big diff from Chicago, but Californians are free and easy folks. You will fit right in and I know you will be a happy camper. Get settled in, oriented, a few workouts in the college gym, get a routine - you will be golden!